The PPP will consist of at least three phases of approximately 20 large projects working in parallel. The Association will suggest a set of projects that could be considered to provide full coverage of the challenges in the call and how these projects will inter-work to ensure the combined results are coherent and effective. 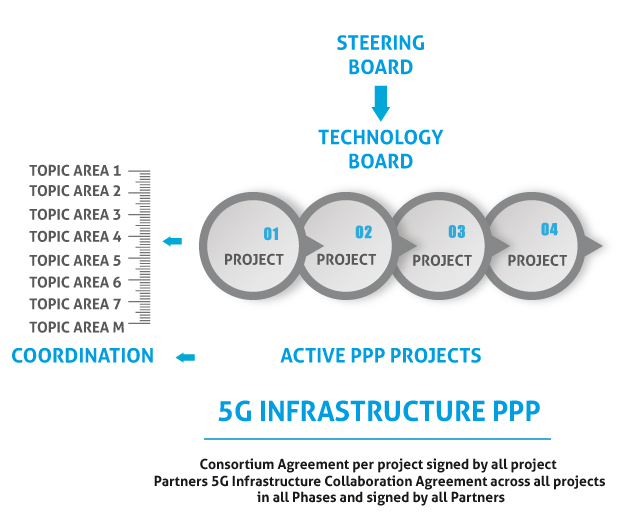 These projects will have unique goals but together the will address the Key Performance Indicators of the programme and fulfill the vision of designing a new network to support the ubiquitous connectivity and communications that industry and society will require in 2020. The structure allows for a steering board made up of the mandated project representatives who will decide on common actions and initiatives of the programme. The technical board will address the inter-working of the technical solutions developed within the projects and ensure coherence and consistency across the programme. A number of technical issues will be identified as having impacts across multiple projects and these will be monitored to ensure good progress with a minimum of duplication of the work.